Our first trip outside of Addis Ababa was to Bahir Dar in Northern Ethiopia. I rose early to catch our short one hour flight and could hardly contain my excitement at finally being able to see the Ethiopian countryside. I had many pictures in my head of what I imagined it would be like and I was in no way disappointed. I had been in the thick of the chaos and crazed life of Addis Ababa, Ethiopia’s capital for four full days when it was time to head out and see the more rural parts of the country, where over 85% of Ethiopia’s population of 90 million live. Landing in Bahir Dar over spectacular Lake Tana, Ethiopia’s largest lake, is a site to see. Unfortunately I was a little too late with my camera but still got some of the beautiful, green countryside. Northern Ethiopia has a wow factor that cannot be denied. Known as the Historical Circuit, this region has bragging rights to over two millennia of ancient history ranging from the world-famous tombs of Aksum, to the captivating castles of Gonder and the jaw-dropping Danakil Depression whose lava lake and plains is a must-see for adventure travelers. 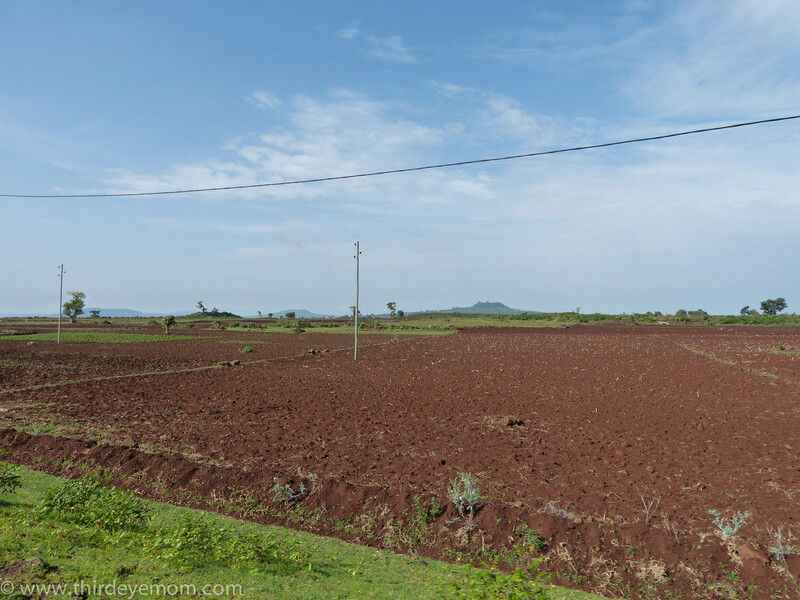 We were headed to Bahir Dar, a lovely town of about 170,000 located on the majestic Lake Tana and sometimes referred to as the Ethiopian Riviera given her palm-tree lined streets and stunning deep blue lake, the largest lake in Ethiopia and the source of the Blue Nile. Bahir Dar would be our base for two days while we reported on newborn health in the surrounding area. As soon as we stepped off the plane in Bahir Dar, I was struck by the purity of the air and the lush, vibrant green color of the land. The scent of an early morning rain still hung in the air something that was becoming more common as Ethiopia entered the rainy season of June, July and August. All six of our drivers had left the night before from Addis taking the eight-hour drive north to meet us in Bahir Dar. We would be traveling on some of Ethiopia’s notoriously bumpy, muddy, dirt roads to reach Mosebo Village the following day and the only way to reach the rural parts of Ethiopia is by Land Cruiser. Over the next ten days, we would be spending a lot of time with the drivers and it was a great way to learn about the history and culture of Ethiopia. One of our land cruisers hired by GETTS transportation. I have never in my life traveled in caravan of six big white Land Cruisers and I was amused by the kind of reaction and attention we received. As most Ethiopians do not have cars especially given the fact that 85% live outside of cities and earn their living from the land, big white Land Cruisers always meant one of two things: NGO or faranji (foreigner). Our caravan always got stares, waves, smiles and whenever we stopped, running children. It was something I could never get used to, being a sort of celebrity to a mass of smiling strangers. I had desperately wished I had stashed my bag with school pens and notebooks to hand out to the beaming children, whose beautiful, curious smiles warmed my heart. Women waving as we pass them by. Our caravan heads to Bahir Dar. Here we are on a paved road but many roads in Ethiopia remain unpaved and impassable during the heavy rains making a Land Cruiser necessary. I was awed by the drastic difference by Bahir Dar’s lush, peaceful beauty compared with the gritty, chaotic mayhem of Addis Ababa. It felt like being in two completely different worlds that somehow coexist and are not too far away. 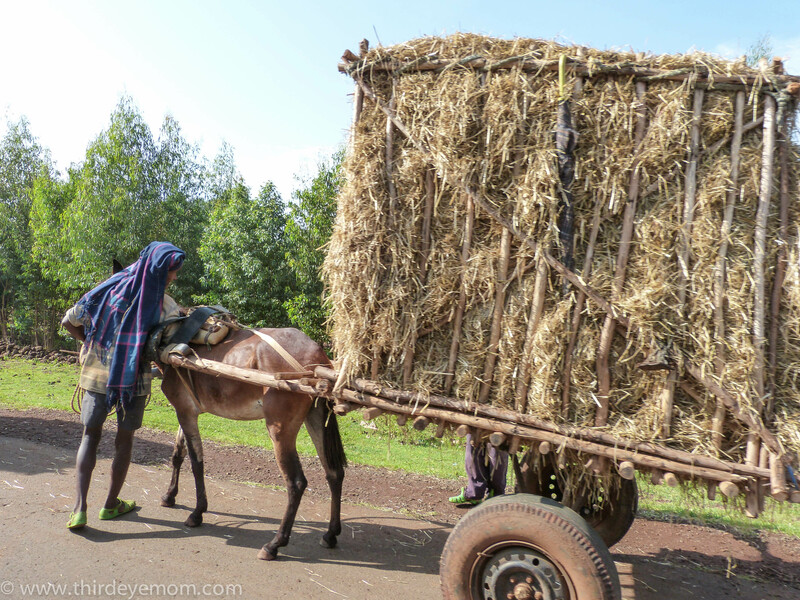 Mule trains are the main form of transport throughout rural Ethiopia and also in smaller towns outside of the capital. Farmer transporting his hay from the village into town. Wood is another huge resource that is hauled from the village into town to sell. Fertile land as far as the eye can see. As soon as you enter town, “Bajajs” are the common mode of transportation and can be seen rambling around everywhere. Ethiopia has its fair share of Bajajs, three-wheeled cars that scoot you around town for a low price. The palm tree-lined streets are indeed reminiscent of the Riviera and added a peaceful feeling to a rather bustling place. Lush palm trees and foliage line the busy streets of Bahir Dar leading into the center of town. Woman walking with parasol to protect herself from the sun. Entering the city of Bahir Dar. We arrived the Avanti Hotel, our home for the next two days, and I was spellbound by the beauty of this magical place, Bahir Dar. There before my eyes was the Ethiopian Riviera, Lake Tana, in all her glory and my heart was smiling. The highlight of the trip was a boat tour in search of hippos and the island monasteries on Lake Tana. It was so magical that it requires its own separate post. Our hotel had a pretty stellar view as well, a view I could get used to. View of Lake Tana from our hotel. Avanti Hotel on Lake Tana. Nature surrounds us at Avanti Hotel where we see hippos and tons of bird life. The grounds were beautiful too with lots of flowers. And a wonderful place to eat right next door on the water. Best of all was the magical sunset over Lake Tana. I could hardly wait to see more! Stay tuned…chasing hippos on Lake Tana and exploring the ancient island monasteries is next! Another amazing post from start to finish! That island in the middle of the Lake Tana is just wonderful. Did you see Hippos? Thanks Jo! It was so spectacular. It was a “wow” factor for me and how mystical Ethiopia truly is. I’m with Jo on the photo of Lake Tana. Incredible! Really enjoying your posts on Ethiopia, I hope to see these places for myself someday. Lake Tana looks incredible! Thank you Tommy! I am really glad you like the Ethiopia posts! 🙂 More coming! Oh hippo chasing!! I can’t wait. Ethiopia and your marvelous portrayal of the people and the country continues to fascinate me. Lake Tana looks gorgeous. I am so surprised at the beauty of Ethiopia. Yes, Ethiopia is gorgeous and I only saw a small part of this mystical land. It was right out of the book/film Out of Africa. So stunning. So green and so magical! Thanks so much! More to come! Such a nice overview of the country… beautiful pictures! Thank ou! More photos and posts to come from Ethiopia! Stay tuned! I loved Ethiopia. Corrine said that Zambia was amazing. I would love to go there someday. Ethiopia looks amazing!!! I see tuk tuks get everywhere but with a different name. 🙂 I especially love your photo of the island on Lake Tana. Stunning shot!!! Thanks Lucy! It was so magical there. I loved it and now need to see more of Africa. Something so mystical about it. The raw beauty of it just blows you away. I haven’t made it to that continent yet but hope to one day! Yep, that Lake Tana photo with the island is a winner! I really love and appreciate the great work that you are doing.This is a wonderful post and has awakened nostalgic feelings in my heart for Ethiopia. In fact my family used to live in Harar ,a northern city in Ethiopia where I got my early schooling. It was a peaceful little town with Italian influences and lovely weather the whole year round . Thank you! Wow, I bet that was pretty amazing living in Harar. I didn’t make it there but I can imagine that it must have been quite a unique childhood. Where do you live now? I bet that is a lovely city. Would love to see it someday!